I recently dined at Bati with a few of my friends on a sunny Saturday afternoon. Upon entering, I noticed the restaurant’s décor. It is decked with original paintings from Ethiopia with sounds of traditional music adding to its intimate setting. Bati was full of patrons but it didn’t take long for us to be seated. Our waitress was very attentive and friendly. Read more. New York – Bati (747 Fulton Street, Brooklyn), the new Ethiopian restaurant in Fort Greene, is now open for lunch after a soft opening the weekend before last. A friend and I tried Bati last weekend and had some of the best Ethiopian food either of us had had in recent memory. The restaurant is still waiting on its liquor license, so it’s BYOB for now, which does always help my culinary memory. We were more in a beer mood, so I grabbed a six pack at Fresh Gardens (729 Fulton Street, Brooklyn), an organic bodega just down the block that has a far better (and less pricey) beer selection than the Provisions market right next door to the restaurant. I assembled a mix-and-match six pack of craft IPAs, including my current favorite, Lagunitas, to complement the spicy food. If you prefer to grab wine, there’s the Greene Grape (765 Fulton Street) wine store one block over. Once having procured proper libation to bring with, it was time to eat. My dining companion is vegetarian, so we had a meatless meal, which isn’t a problem, since Bati, like most Ethiopian places, is quite veggie friendly. We started with Ye Timatim Fitfit ($5), a mix of tomato salad and torn up bits of injera–Ethiopian flat bread. The tomatoes tasted deliciously fresh on yet another dreary winter night and the bits of injera were brushed with just enough kibe–clarified butter with herbs–to impart a buttery goodness without heart-attack thoughts. For our main course, we split a vegetarian combination platter ($14), which, with the appetizer, was more than enough for the two of us. Of the four dishes on the platter, the clear winner was the Buticha–ground chick peas blended with spices, onion, and pepper. It reminded me of a drier, fluffier Ethiopian take on hummus and provided a fresh, cool counterpoint to the warmer, saucier elements on the platter. Owner Hibist Legesse has described the food as “traditional Ethiopian with a focus on nutrition and health” and the food tastes healthy in the ways one wants it to–the vegetables are fresher and the flavors cleaner than many other things we’ve scooped up with injera, and the injera itself is spongy and flavorful without being too heavy (very important when consuming with IPAs aplenty)–while still retaining the tasty unhealthy elements–butter! The space itself is lovely. The panes of the large windows facing the street have been painted a shade of vermilion that perfectly complements the dark wood, and the artwork is minimal and soothing. Its dimensions are more East Village than Brooklyn, though, and the place can get a bit too cozy when full. Service is warm and friendly but still working out some kinks, as to be expected in the early weeks. It took a while to get our food and there seemed to be a napkin shortage, rather comical when you’re eating with your hands. All are minor inconveniences, however, easily washed down with another IPA. 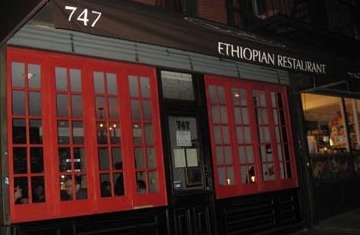 In a neighborhood has some great eating options from Africa—from South African fare at Madiba (195 DeKalb Avenue, Brooklyn) to Senegalese food at Abistro (154 Carlton Avenue, Brooklyn)–this Ethiopian addition is a very welcome one.